Combine whole wheat flour, all purpose flour, sugar and salt in a large bowl and mix everything well. Add dry yeast, sugar in warm water and mix well.Let it stand for about 10 minutes. When yeast mixture is ready add softened butter and vanilla essence into it. Now add this yeast mixture to the combined flour and knead well till you get very stiffy dough.If required you can use little of warm water. Knead this stiffy dough for about 5 to 6 minutes by adding dry flour and prepare a soft dough. Place this soft dough into the greased bowl,cover it with damp cloth or plastic wrap for about 1 &1/2 hour. Keep it in the warm place( You can keep in the oven,just switch the oven to 200 deg F for about 3 to 4 minutes, then turn off the oven. ).This will make dough ,double in its size. After1 &1/2 hour,punch the dough and remove all the air from it. 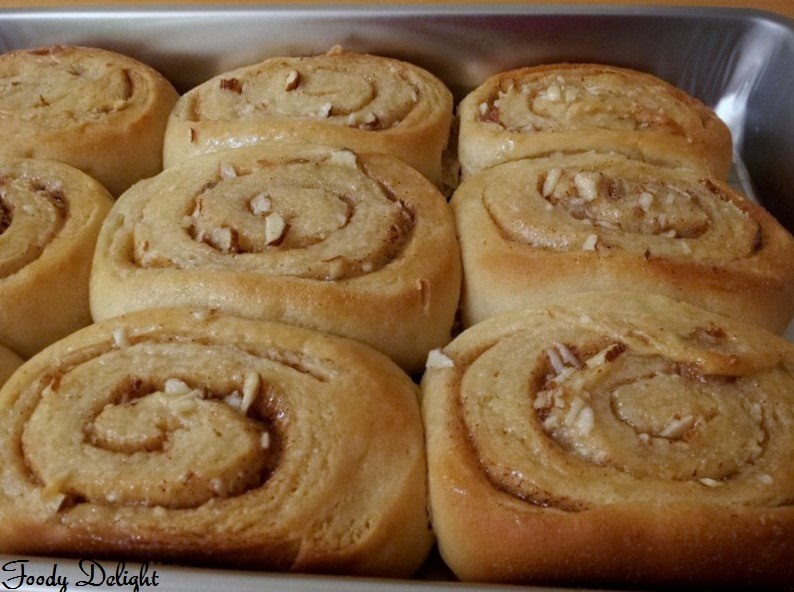 Roll out the dough into rectangle shape and spread cinnamon mixture on it. Then roll the dough into log shape and cut into pieces . Place these cut pieces into baking tray, cover with damp cloth or plastic wrap and again keep it in warm place for about 30 minutes for second rise. For preparing the glaze mixture, mix softened butter, powdered sugar and little warm milk.. Make a smooth paste. After 30 minutes, brush the rolls(cut pieces) with glaze mixture. Bake at 375 F for about 15 to 18 minutes or until light golden color and done. 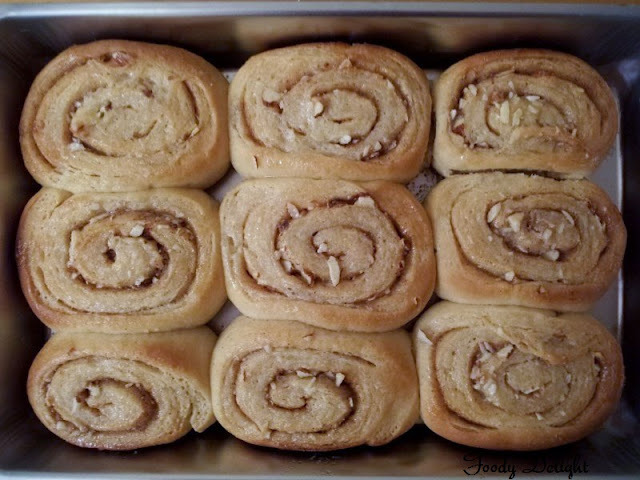 When done, glaze all the rolls using the remaining icing mixture. If icing mixture is too thick,add little water and make it thin and add little vanilla essence for more flavor. Yummy yummy...n they r rolled very well. 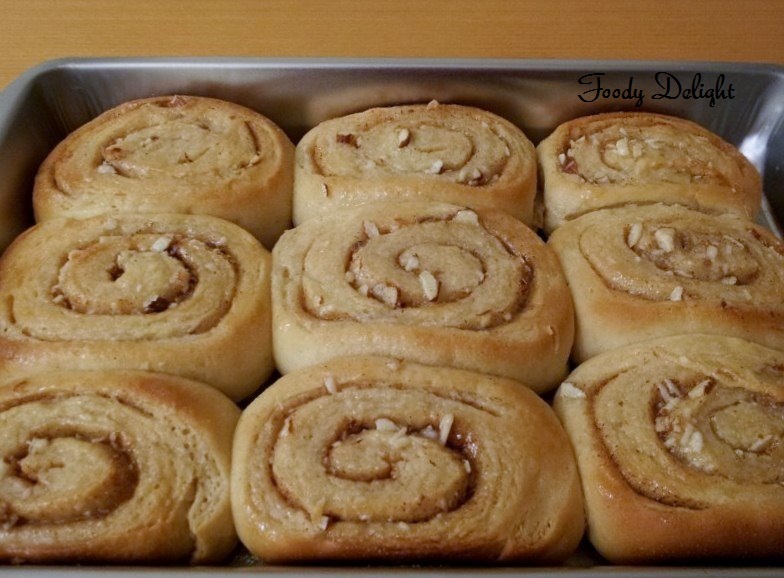 Nice flaky n delicious rolls,yummy!! 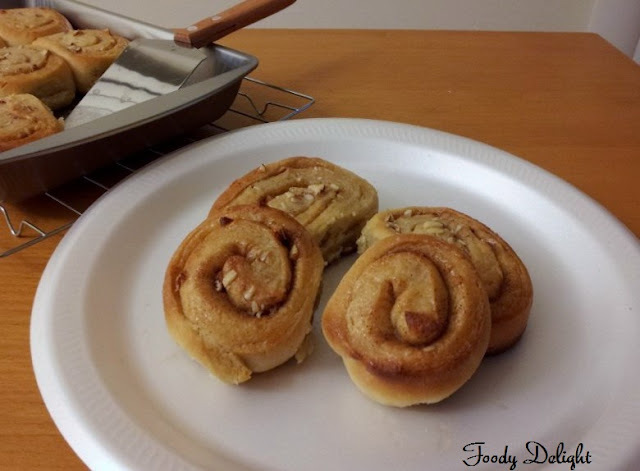 My kids LOVE cinnamon rolls...thanks for a great recipe to try! Thank u for visiting my blog.I will try this and let u know.